The bathroom should be a place in which you can feel at peace and relax. In a lot of homes, it seems that the original designers squeezed the bathroom into the smallest possible space - as if they considered it a necessary evil. Very often the bathroom can be the coldest and bleakest room in the home - especially in the depths of winter. With a little thought and a minimal cash outlay, you can transform any bathroom into the comfortable room it should be. You may be lucky enough to be designing a new home, an extension to include a bathroom or (yes, even in this day and age) upgrading a property which has never had the proper facilities. 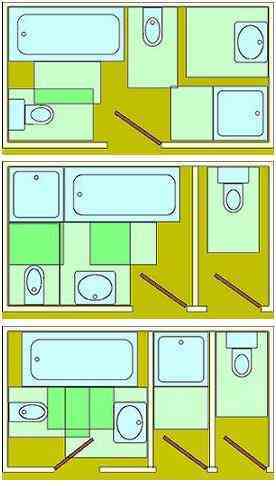 Any of these allow you to greatly influence the size and layout of the bathroom in your home. The following is intended to help you with the actual planning, but they are only suggestions and may not be practical in all situations, you will often have to compromise. The golden rule is - keep the design simple - and remember that the bathroom can be a selling point for a house but you need it to suit you while you are living there. Designing a new bathroom layout - remember there are no absolute rules, after all it is your bathroom but. . .. . . . .
First of all, list items you want included in your bathroom suite, these are the most likely ones you will want to include. Although not affecting the floor space, if you prefer a WC with a pedestal mounted cistern, low level or high level cistern - this will affect where you can position the pan. Measure your bathroom at floor level and at about 900mm from the floor - use the smaller measurement for your floor plan. Mark on the plan the services as they currently exist - hot and cold water, drains, electric points, any existing extractor vents in the walls etc. Cut out paper or card scale footprints for each of the suite units you want to include, there are a range of sizes available but you probable only need worry about the exact size if you room is very small. The footprint should include the required working area around each unit. Bath - 1100 x 700mm (43 x 28in) alongside and 2200mm (86in) headroom (this can be reduced if the bath is sunken). Basins - 200mm (8in) on each side and 700mm (28in) in front. WCs and bidets - 200mm (8in) on each side and 600mm (24in) in front. Showers - If enclosed on three sides - 900 x 700mm (35 x 28in). Shower - if not enclosed - 900 x 400mm (35 x 16in). Write the name of each unit on its respective piece of paper/card. Roughly position the scale footprints of the fixtures in their most logical position with respect to the existing position of the services. Do not worry if you cannot fit the units to the existing services, it just indicated that you will need to add or move some. The position of any window in the room can influence where you position the units, a high window may be less of a problem but you are unlikely to want to position a shower in front of a low level window. Look at the free area between the units and decide if you can fit any other floor items you need (such as laundry basket or stool). If you cannot fit in all the units you want, or you think the room is too crowded, ask yourself if you really need all you've chosen or can you relocate any unit in another room - i.e. move the shower into the corner of a bedroom. You may also consider having a shower head positioned over the bath rather than a separate shower cubicle or using a corner bath rather than the traditional style of tub. This figure shows good usage of a small space - there is actually very little option in positioning all the units in the small space. 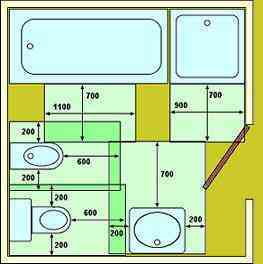 Think how you can rearrange the bathroom to make it easier to use, begin to think about relocating the position of the existing services. All services and window/doors can be repositioned - it is just that additional work is involved; the rough order from easiest to most difficult is - electricity, water supplies, drains (above floor), blocking up doors/windows, drains below suspended floors, drains below solid floors and moving doors/windows. But remember that you may need professional assistance to move doors/windows. You may consider that the room will adequately take all the units and it might be worth thinking if the space could be better used. The illustrations to the right give an idea of how a large bathroom could be divided to provide a separate WC (centre figure) or both a separate WC and shower. New separating walls - no great problem. New doorways - you might need professional assistance especially if you need to breakthrough load bearing walls. New windows/ventilation - you might need professional assistance especially if you need to breakthrough load bearing walls. Do not be deterred if the shower/WC are not positioned on an outside wall - automatic extractor fans can be fitted to ventilate the areas through ducting. Two possible ways to automate the control of the fan are to interconnect the fan with the light or to use an ultrasonic (or other) movement detector so that movement within either room will operate the the fan. Bearing all this in mind, 'play' with the layout to achieve your dream bathroom - then look at any relocation of services required - are you happy with the amount of work involved? You may decide it is too much work and will have to compromise. When you are happy with a basic floor arrangement, think about the wall area and where you can fit any wall mounted accessories to wish to include. you can almost guarantee that you will be able to find a suitable replacement for any item needing replacement in future. you will be able to select different items from different manufacturers - remember, while complete suites are often promoted, you can purchase each item separate if you require. When selecting decorating colours, take into account the natural light of the room, you do not want the room to be too dark or cold. Our colour wheel may help you choose the colours you want. White fixtures do not mean that your bathroom has to have a cold feeling, you can introduce a bold colour scheme with tiles, paint, wallpaper and fabric to make your bathroom distinctive. You can afford to be adventurous in decorating the bathroom as you do not spend that much time there and can use a colour scheme which might be overpowering if you had to look at it all day. One or two rolls of wallpaper may be enough to decorate the room so don't be too limited by the price of the paper. Try to select vinyl or wipe clean wall papers as these stand up to the ever present condensation. Choose curtains and wallpaper which incorporate the colour scheme of your fittings. Before purchasing any new bathroom suite, check that the size of the various pieces will not only fit into the bathroom but will allow you to manoeuvre each piece through the home - you may need to move the pieces around corners on the stairway or through awkwardly positioned doorways. External ventilation is required for a bathroom and WC, this can either be by an opening window or the use of an automatic extractor fan and duct connected to the outside, so you may be able to find room for a shower or WC on a landing or under the stairs if you can install a small ventilation duct to the outside world. A room containing a WC must be separated by 'a door' from an area used for the preparation of food - it used to be that a room containing a WC could not open directly off a kitchen, living or dining room; this is not now the case. If the only bathroom in a dwelling leads off a bedroom, it must have another access door not through the bedroom.